Artist's rendering of the SpaceIL Google Lunar XPrize spacecraft conducting its mission. Andrew Barton, director of technical operations, Google Lunar XPrize contributed this article to Space.com's Expert Voices: Op-Ed & Insights. Since 2007, teams of entrepreneurs from around the world have been working towards a dream: To kick-start a new era of commercial exploration on the moon. Today, with the awarding of the Google Lunar XPrize Milestone Prizes, five talented teams have proved that those dreams may become a reality sooner than later. To win the $30 million Google Lunar XPrize, teams are required to land a robot on the moon. That robot must travel at least 500 meters across the lunar surface and send high-definition video and imagery back to Earth. The Milestone Prizes have focused on three areas that are vital to the completion of this unprecedented mission: landing, mobility and imaging. The judging panel, whose experience stretches from the Space Shuttle program to Philae's recent touchdown on Comet Churymov-Gerasimenko , are well aware of what it takes to achieve a successful landing — and of the potential pit-falls. The judging process has taken more than a year and involved nine expert judges who monitored more than 25 tests and participated in more than 20 technical review meetings around the world. Reaching the moon is only the first step in claiming the Google Lunar XPrize. Following launch, a spacecraft must transit the roughly 400,000 kilometers to the moon. It must then fire its rocket engines with high precision to bring it down to the surface and make a landing attempt. By the time it touches down on the lunar surface, the lander will have slowed to less than human walking speed. The touchdown itself is hazardous, since the surface is pitted with craters and strewn with boulders ejected from meteorite impacts. For the Landing Milestone Prize, Astrobotic, Moon Express and Team Indus successfully demonstrated advanced progress towards building a spacecraft that can complete this journey. Astrobotic presented the development of an autonomous landing system that can determine the spacecraft's position and altitude by comparing images from cameras on-board its "Griffin" lander with NASA high-resolution images of the lunar surface. During the descent, Griffin will use a laser sensor to construct a 3-D model of the surface autonomously determining the safest site to land. In June 2014, Astrobotic demonstrated its landing system’s hazard avoidance functionality for the judges during field tests in the Mojave Desert. The team's hazard avoidance software, together with a prototype sensor package, were integrated into the Xombie test platform, a suborbital rocket owned and operated by Masten Space Systems. Astrobotic's technology successfully steered the rocket-powered vehicle away from the threats for a safe landing. The XPrize judges also reviewed the design and analysis of the team's lander across all key mission phases and in December 2014 witnessed a test of the ignitor for a new rocket motor that will power the Griffin lander. Team Indus constructed a full-scale prototype of their lander structure, built from aluminum honeycomb panels to give it a lightweight structure and featuring four impact-absorbing landing legs. During two weeks of intensive tests in December 2014, the lander was put on a shaker-table at the Indian Space Research Organisation (ISRO) to test if it would survive a launch and the team dropped it from a height of one meter in the first of a series of drop tests at India's National Aerospace Laboratory (NAL). In numerous technical meetings with team members, the XPrize judges reviewed the design of all critical lander subsystems to assess the level of progress towards flight readiness. Moon Express has developed an innovative, flexible spacecraft design, the MX-1,that could one day complete a range of commercially valuable functions in orbit, in addition to its main role as a lander. The MX-1 has a rocket engine that uses kerosene and hydrogen peroxide in bi-propellant mode to power the spacecraft through the series of orbital maneuvers needed to reach the moon, along with outboard thrusters using hydrogen peroxide in monopropellant mode that fire just before landing to ensure a gentle touchdown. The spacecraft's most distinctive feature is its pair of toroidal (donut-shaped) tanks, which maximize the amount of fuel and oxidizer that can be carried by the compact spacecraft. In December 2014, Moon Express carried out a series of tests for the XPrize judges at NASA's Kennedy Space Center. Suspended from a crane and attached to the ground by tethers, a special prototype lander, MTV-1X, tested guidance and control functionality, as well as elements of the propulsion system design. Engineering models of the dual rover system including the four-wheeled Moonraker and the two-wheeled Tetris rovers undergoing field testing at the Nakatajima Dune, Hamamatsu, Shizuokain, Japan, in late 2013. Hakuto has chosen to focus solely on the mobility aspect of competition and will purchase a ride to the moon with one of the other teams. 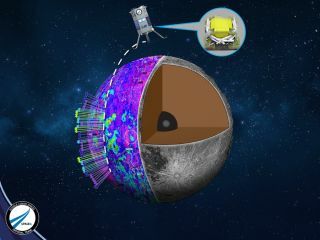 They have developed a small and lightweight rover called Moonraker for the Google Lunar XPrize challenge and are also planning to send a smaller rover called Tetris for an additional science mission to explore other areas beneath the moon's surface. The four-wheeled Moonraker will tow the two-wheeled Tetris on an extendable tether that will enable the smaller rover to drop into a lunar cave. Hakuto has built its rovers from strong, lightweight carbon-fiber using molded composite processes from the Formula One industry. The team put their hardware through thermal vacuum and vibration testing in September 2014, and in December, Hakuto tested their vehicles on the beach in Hamamatsu, Japan. The team demonstrated deployment of the rovers from a container designed for integration onto the host lander and remotely drove Moonraker the necessary 500 meters. Astrobotic is also planning to investigate caves in the Lacus Mortis (or Lake of Death) region of the moon. Their rover, Andy, has a stable, four-wheeled design with a low center of gravity. For the Mobility Milestone Prize testing, Andy was put through its paces over rough terrain at the NASA Glenn Research Center in Cleveland, Ohio. The XPrize judges were also given a demonstration of the rover's deployment from the Griffin lander as well as the opportunity to observe vibration tests of key equipment items on the rover. Part-Time Scientists is planning to send their Asimov rover to the Moon aboard their Isaac landing craft. The team crossed Europe in their pursuit of the Mobility Milestone Prize, with test locations ranging from the volcanic slopes of the island of Tenerife to the planetary surface facility at the German Aerospace Center's facilities in Munich. The field site in Tenerife is one of the closest analogues of the lunar surface on Earth in terms of the geology of the rocks, the rough terrain and the harsh lighting conditions. As well as demonstrating the rover's ability to maneuver over this surface, Part-Time Scientists demonstrated that the rover was stable during deployment from a prototype lander. Through vibration and thermal vacuum testing of key components, the team investigated their rover's ability to withstand the harsh temperature and vacuum environments it will encounter during its mission. Field test of the Astrobotic Red Rover in a quarry. To win an Imaging Milestone Prize, the teams were asked to complete a ground demonstration of their "mooncast," collecting high-definition imagery and video in the same manner that they would during their actual Google Lunar XPrize mission. On the moon, this will include a 360-degree panorama of the landing site as well as eight minutes of dynamic video showing the landing, mobility and potentially other phases of the mission. The teams were also expected to carry out other tests to show how their imaging equipment will withstand the lunar environment. Astrobotic completed their mooncast demonstration at an outdoor location near Pittsburgh, Penn. that closely resembles the appearance of the lunar surface. The robust industrial camera on which their imaging system is based is used for a variety of terrestrial applications. Moon Express has integrated an off-the-shelf commercial camera into a custom arm assembly, which allows the imaging system to pan and tilt as well as take "selfies" from the top deck of the lander. Moon Express conducted thermal vacuum tests and reviewed existing radiation data to confirm that the camera can withstand the lunar environment. The Milestone Prizes were optional and not every team chose to participate. All 18 Google Lunar XPrize teams are still eligible to win the Grand or Second Place Prizes. However, the Milestone Prizes represent real, independently judged achievements by the winning teams in this new race to the moon. The testing process has shown that Google Lunar XPrize is as much about the human stories of the teams as the technology. Events like the unveiling of Team Indus's lander, and the spiritual ceremony that followed, was an emotional moment for all those involved. The teams competing for the Google Lunar XPrize have collectively invested countless hours of manpower, millions of dollars and an immeasurable number of hopes and dreams. The announcement of the Milestone Prize winners demonstrates that those efforts are coming to fruition.